Home » Work » Faith, Prayers and Food! 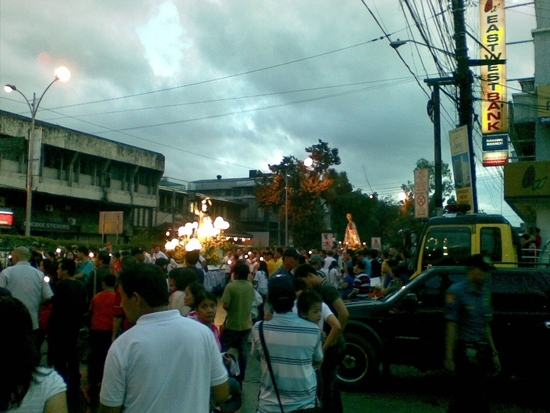 Ever since I became employed with a Catholic education institution, attending the Our Lady of La Naval procession was an annual activity we have to attend. Further details about the history of the Our Lady of Naval can be found in this site. 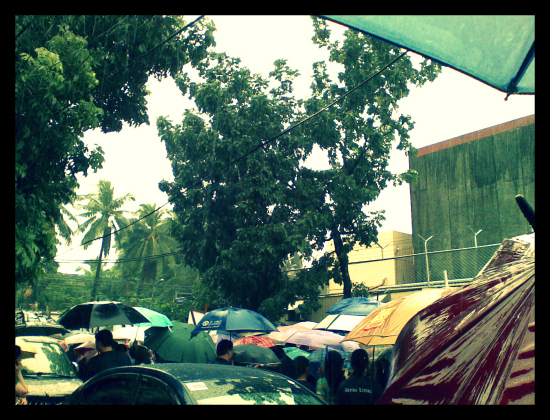 It was raining profusely before the procession started. All of us were wondering whether the procession will continue. But when the image of the Our Lady of La Naval was moved out of the St. Domingo Church, the rainy suddenly subsided. I believe the power of the devotees' prayers and faith worked. I joined the procession, with Tinee and Tara, and before we parted ways we had dinner to a restaurant I haven't tried. Chicken Charlie is one of the best restaurants in the heart of Banawe, Quezon City. Not all Filipinos may realize that Banawe is known for two reasons. It serves as a central market for cheap car accessories and spare parts and a haven for the best foods in town. Car accessories and food? Not really a perfect match but Banawe have proven that it is possible. One of the best chickens I have tasted in my entire life would be from Chicken Charlie. The restaurant claims that they have a unique approach in frying their chickens. This approach and secret spices make their chicken crispy, but not greasy, and flavors are bursting as you savor each piece. Taste is exceptional for Charlie's Chicken. But in terms of price, I could say that Charlie's Chicken will not cause a big damage to your pockets. Prices are affordable. Great food at great prices, what more can you ask for! For the benefit of my international readers, a US dollar equates to around Php 45. A budget of Php 500 or $11 will already go a long way for four people. Thanks for sharing the event of faith Diane. And WOW - that food looks fabulous! Hope you have a wonderful week! Hmmm. Have to try that one maybe... ol' Charlie's! The terrific photo you took of the chicken wings has me drooling! Your festival was beautiful, despite the rain-full beginning. i have never been to one of those processions but how wonderful that the rain stopped just in time. God is amazing! Your day was really blessed!! I think Chicken Charlie should hire you, chicken sales would triple. Your pictures always make me so hungry. YUM! Sounds like a neat procession, and lots of people ! The chicken looks yummy. Have a great week! Looks like some nasty weather you had to contend with, I'm glad the rain stopped for the procession. I love fried chicken and Chicken Charlie would definitely be something I would try. After reading your previous post too I can bet that you had the potatoes with your chicken!! chicken charlie reminds me of Chick fill a here! I will be starting the link party this Tuesday. A little while back you expressed your interest and I would love to have you. Come link up, the button that should go with the post will be up on Monday. Remember it's all about cherishing our memories and the past for they made us who we are today. Have a great weekend Diane!